Visit RT.com to get news and information about Alina Zagitova, who is a young Russian figure skater. Alina Zagitova won the first gold medal for the Olympic Athletes of Russia (OAR) at PyeongChang 2018 when she was just 15. She also smashed the world record in the ladies’ short program. Follow RT to get the latest news and updates on her sports activities, as well as some details of her everyday life. Find news on her background and other personal achievements. Zagitova faced a lot of criticism from the Western media – for example, from USA Today columnist Christine Brennan, who criticized the figure skater’s strategy at the 2018 Winter Olympics. You can find news on this and other matters on RT. 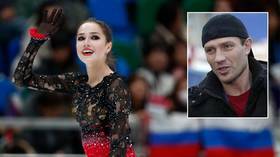 Olympic gold medal-winning ice dancer Roman Kostomarov has called on the newly-crowned world champion Alina Zagitova to quit the sport before the next generation of skaters capable of performing quads dethrone her. Russian figure skating star Alina Zagitova has revealed the struggles she faced ahead of the recent world championships in Japan, saying she was on the verge of “quitting and leaving” as she struggled to find form. Russian figure skating star Alina Zagitova was forced to compete through the pain at the national championships in December after she badly burned and blistered her foot prior the tournament, it has been revealed. Russian Olympic champion Alina Zagitova has added yet another title to her growing collection of awards after winning gold at the 2019 World Figure Skating Championships in Japan. Russian figure skating ace Alina Zagitova was forced to spend a sleepless night in Saitama, Japan, after doping officers kept her back for more than five hours after she won the World Championships short program on Wednesday. Russian figure skating star Alina Zagitova has stormed into the lead at the world championships in Japan, flawlessly executing her short program and becoming the sole athlete to break the 80-point barrier.